2, support 24Bit 192K High Definition Audio. 4, all aluminum chassis, good shielding effect to ensure the quality of tone. 5, durable laser system has always been for many machine selects. 6, carefully adjust the servo circuit, the external independent crystal oscillator circuit for the DSP to provide accurate digital master clock. 7-jitter digital audio output is added to reduce the synchronization plastic handle. 8, two transformers were part of the independent power supply circuits for digital signal and movement motor control. 9, has a high-quality CD turntable has a wealth of information and sound and atmospheric sound quality performance. 2, high production process requirements of the power transformer and the output transformer. 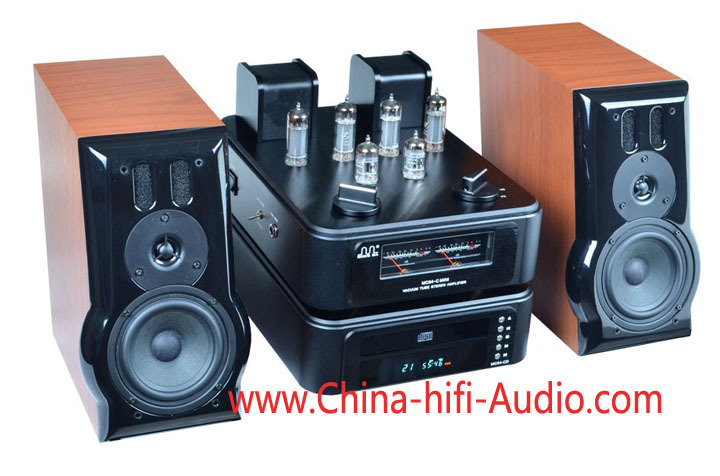 3, the output power of each channel 12W HIFI speaker driver 50-100W, mellow sound, smooth, clear and restore. 4 of headphone amplifier, pristine sound at the end, restore sound field effect is very good. 5, can be connected to a PC, a wide selection of different styles of music. With HIFI Speaker MD007-I, sensitivity 92DB 50-100W.